Dyed Easter eggs dry on paper towels. intro: Hunting for eggs this weekend? Easter festivities can be fun for the whole family, but hidden allergens can quickly turn the holiday into a nightmare. "Holidays can be a challenge because of the focus on food," said Dr. Michael Pistiner, a pediatric allergist with Harvard Vanguard Medical Associates in Boston. "Everybody loves to give treats, so it's really important to train kids with food allergies to say, 'No, thank you so much, but I can't.'" Easter candy and homemade treats aren't the only allergy triggers. Brightly-dyed eggs and relatives' pets can cause miserable reactions in kids and adults alike. And let's not forget about spring pollen wreaking havoc on sinuses. Here, a list of Easter allergy triggers and tips to stay out of harm's way. quicklist: 1 category: Easter Allergy Triggers title: Easter Candy url: text: It can be hard to resist the molded chocolates and spongy sweets of Easter. But the tempting treats can contain traces of nuts, milk, wheat and eggs. "You really need to read the label every time," said Pistiner, noting that companies can change their manufacturing processes or ingredient lists without notice. "If you can't read it, don't eat it." Prevention is key, but emergency preparedness is just as important in the event of an unexpected reaction, according to Pistiner. "Know how to recognize and allergic reaction and anaphylaxis -- a life-threatening allergic reaction -- and know how to use an epinephrine autoinjector if a doctor prescribed it," he said. Always be aware of what kids are eating and sharing with others, Pistiner added, stressing that invisible allergens can linger on cups and cutlery. And make sure kids feel comfortable speaking up if they feel unwell. "There's always going to be a first reaction," he said. "And it can definitely happen on a holiday." quicklist: 2 category: Easter Allergy Triggers title: Homemade Treats url: text: While packaged candies come with a list of ingredients, homemade goodies can contain just about anything. "It's tricky. You're really putting your trust in the skills and knowledge of someone else," said Pistiner. Even the best-intentioned baker can accidentally let traces of allergens sneak into the mix. But it can be hard to say no to a generous host. "I teach people about this stuff all the time, but when I'm in that situation with my friends and family, it's still a challenge," said Pistiner, who has a child with food allergies. "It's hard to say no, but it's necessary." 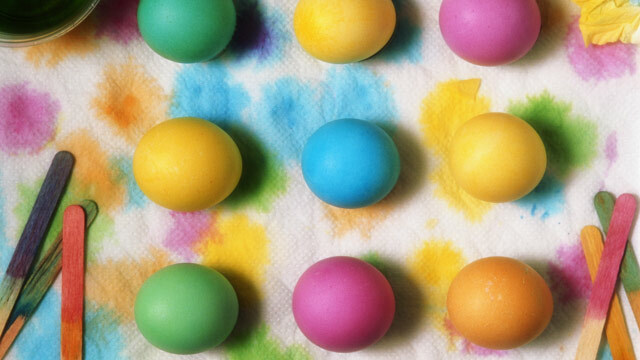 quicklist: 3 category: Easter Allergy Triggers title: Colorful Eggs url: text: Easter crafts can also trigger allergies. Dying eggs in food coloring can cause skin reactions in people with sensitivities. And eggs themselves are one of the most common food allergens, according to Pistiner. "If someone has skin contact with a food they're allergic to, they can have local rash. It can turn into a more severe allergic reaction if there's exposure to the eyes, nose or mouth," said Pistiner, adding that young children put their hands in their mouths as often as 80 times an hour. "Any skin exposure can very quickly turn into an oral exposure." quicklist: 4 category: Easter Allergy Triggers title: Spring Air url: text: Warmer weather means tree pollen -- spring's most ubiquitous allergen. "It can cause sneezing, runny noses, nasal congestion, itchy, watery eyes, coughing, and can trigger asthma," said Pistiner. You might be tempted to open the windows for some fresh air this weekend, but keeping them closed can prevent pollen from polluting the Easter party. Antihistamines and other medications can also help ease the symptoms of spring allergies. Talk to a doctor about options for adults and children, Pistiner said. quicklist: 5 category: Easter Allergy Triggers title: Bunnies and Pets url: text: Dander and saliva from dogs, cats and, yes, even bunnies, can cause allergic reactions on par with pollen. So when visiting relatives with pets, be sure to go prepared. "Bring up those issues with your doctor," said Pistiner, adding that antihistamines and other medications might help. "But you also need to be careful about what the pets are eating. If they eat a peanut butter treat and then smooch a child with peanut allergy, there can be a reaction."